Down there in the basement, I just know it’s a lot. Mostly I wonder what I’ll do with the rest of my life. What about the music that was such a big part of his life? Thousands of radio programs, so many great songs. Now I’m on a plane home from Texas, in a middle seat alone. Sharing red wine and stale pretzels. We laughed and we talked and planned the week to come. The winds of the last couple of days reminded me of the really horrendous windstorm that visited Southern California six years ago. We were without power for days on end, huddled in front of our gas log fire and burning candles for light, reading by flashlight and eating everything out. No power, No coffee! John figured out a way to rig up an old dial telephone, charge our phones and make my curling iron work so I wouldn’t look exactly like Broomhilda. Trees were uprooted all over town, huge trees hundreds of years old, tossed about like tinker toys. We live close to the Los Angeles County Arboretum, where 400 magnificent trees were blown over and ripped out of the ground. The Arboretum, in their wisdom, offered this rare, unique wood to artists who worked in wood and asked them to express through their art what was in the grain and hearts of these trees. 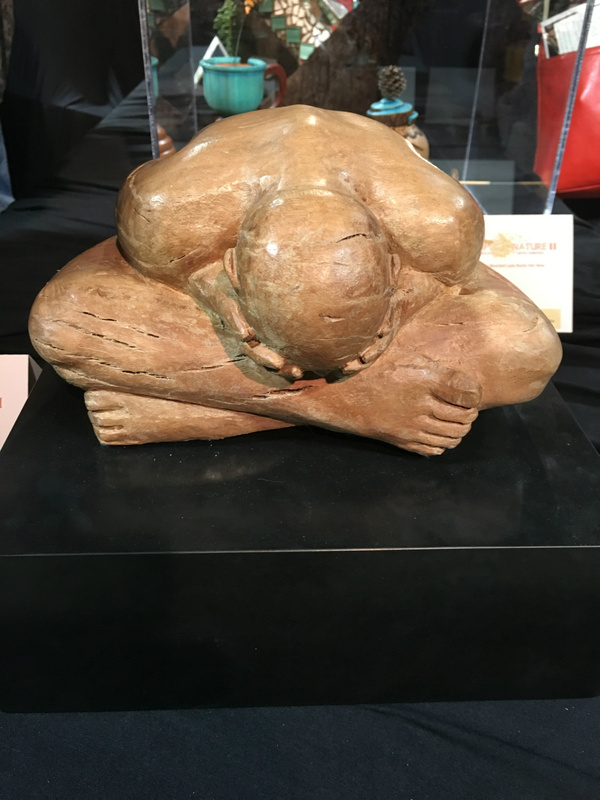 This piece, “Weeping Man” by artist Gonzalo Algarate, was carved from Eucalyptus globulus – Tasmanian Bluegum. I saw this work at the “Force of Nature II” Arboretum art showing last week and it pretty much expressed how I have felt since my beloved John took up residence in heaven last October 9th. The anatomy of this man and his posture are tremendously moving. This is a deeply moving work. Learning how to be alone isn’t easy, but I’m doing it. I even decorated a little for Christmas and bought a bunch of Poinsettias from Trader Joe’s and put them around. Little by little, I’m doing the things one has to do and I know I’ll see him again one day. I’m grateful for family, who support me and love me, take me places, and pat me when I cry. I keep his pictures around me, I love that crooked smile.